A seedling raised in Cornwall by John Hogan and named in 1994. 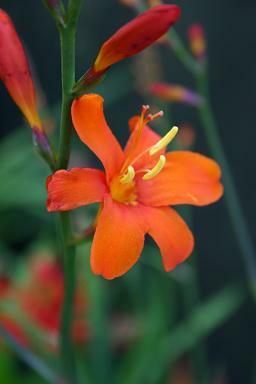 The parents were Crocosmia x crocosmiiflora and 'Lana de Savary'. 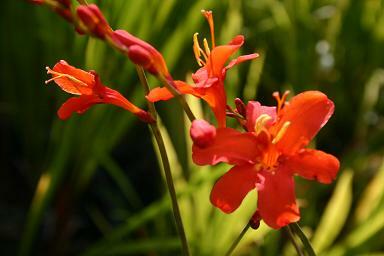 'Lana de Savary' is itself one of his hybrids, from Crocosmia x crocosmiiflora and Alan Bloom's 'Lucifer'. I am rather fond of this hybrid because of a trivial personal connection. Back in the days when I still ran a nursery, I think I sold John his original stock of 'Lucifer'. 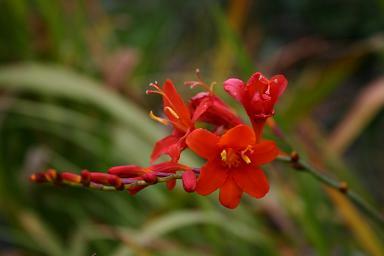 He had brought some very dwarf Aubrieta hybrids over to show me, and went away with the Crocosmia as well.